Julia Haigney, who is graduating from the law school, will speak at University Commencement on the National Mall. University President Steven Knapp announced she was chosen as the student speaker at a ceremony last month. Haigney will speak on stage at University-wide Commencement on the National Mall Sunday. Originally from Long Island, N.Y., she said she came to GW as a nervous 18-year-old, but the people she met and experiences she had along the way pushed her to constantly try new things – including trying out to be Commencement’s student speaker. “This is an interesting place to reflect on how much I’ve tried and how much I’ve grown and really thank the people who have pushed me to try those things,” she said. Haigney said she focused her speech on how students can have a variety of experiences at GW and uses a “Green Eggs and Ham” metaphor from the beloved Dr. Seuss book. “We’ve all grown, and although we are all a part of the Class of 2016, we arrived at GW at different times and in different ways,” she said. The double alumna was selected as the 2016 student Commencement speaker last month from a pool of 54 undergraduate and graduate students. 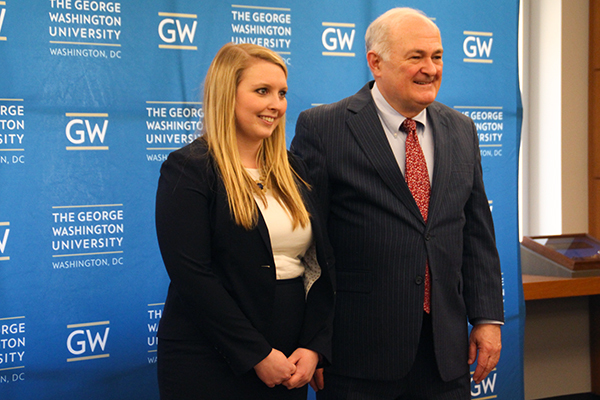 Haigney graduated with a bachelor’s degree in international affairs in 2011 before starting at GW Law School. After graduating from law school, she will clerk for a judge in South Bend, Ind. She said she hopes to eventually work in litigation. When she first came to GW, Haigney said her goal was to eventually attend GW Law School, but she had doubts at the end of her senior year. “I remember toward the end of senior year, I visited a professor’s office hours and just ended up crying, thinking that I wasn’t smart enough to do this,” she said. After completing her undergraduate degree, Haigney worked as a summer assistant at GW coordinating summer housing. When her job there ended, she became the department operations supervisor for the Center of Student Engagement. She now serves as the senior notes editor for the GW Law Review – deciding which scholarly papers are published in the student-run journal. During her undergraduate career, Haigney was a resident adviser in Thurston Hall for two years and was a member of Phi Sigma Sigma sorority, serving as recruitment chair and formal chair. Haigney said competing in Van Vleck Constitutional Law Moot Court Competition this year prepared her to give the Commencement speech. “I did not intend to be a part of a publication, but it is a wonderful experience,” she said.